In fourth grade, everyone had the opportunity to start playing a string instrument and take lessons once a week during school. A bunch of my friends picked up the violin or cello, but I held out for fifth grade when you got to try the wind instruments. My sister had played the clarinet, my brother played the trumpet, and I knew I would either play the saxophone or the French horn. I couldn't wait for the day that the instructors would come to demonstrate the instruments for the fifth graders - it was going to be great! But then that day came, and I discovered that the instructors were experimenting with my year. Since there were multiple elementary schools in town, they only offered four instruments at each school with the assumption that then they wouldn't end up with thirty flutes and two trombones in the middle school band. At my school, you could choose either the flute, clarinet, trombone or trumpet. No saxophone, no French horn. I wasn't sure what to do. After talking to my brother, I decided to try the trumpet and borrowed his old student instrument. I liked it, I was about as decent as any fifth grader could be, and I enjoyed my lessons and band practice on Thursday afternoons. Some time in the middle of the year, though, I freaked out. What if I was supposed to be a saxophone player? What if I never tried it, and that was the instrument I was meant to play? I have a distinct memory of curling up on my mom's lap in our kitchen (even though by this point I was definitely more than five feet tall) sobbing because I was so worried that I had made the wrong choice and would never be able to correct it. She assured me that everything was going to be okay. I should finish the year out on the trumpet, and then in the future, if I really wanted to, she said I could try the saxophone and see how I liked it. I stuck with the trumpet and have continued playing through college. In many ways, had I switched I would not have had the same experiences and may have ended up with different groups of friends and maybe a different personality or future goals. Trumpets are in wind ensembles, jazz ensembles, and orchestras, while saxophones are only occasionally in orchestras. Through playing the trumpet, I performed in ensembles at Symphony Hall and the Monterey Jazz Festival and have met some of my best friends in bands, jazz ensembles, and orchestras. I'm happy with the choice my fifth grade self made, despite the anguish at the time. As I face graduating from college this Saturday, though, I find myself in a similar position. I've loved earning a degree in history, but looking towards the future and job prospects, I'm nervous about the choices I make. What if I'm supposed to be in arts administration? What if I'm supposed to earn a PhD in history? What if really, all this time, I was actually destined to be Tina Fey's co-writer (and best friend)? What if I start on a career path and make the wrong choice? I try to take a step back and put everything in perspective. I've watched my siblings and others change jobs to find what they liked best, and I know many people do switch careers entirely multiple times in life. My job right out of college is unlikely to be my lifelong career. And my mom's advice when I was eleven is still true - it's not impossible try something out to see if it fits for me. Do you have any advice for soon-to-be graduates? A new location on the list of places I'll miss! Okay, maybe it's hard to read the sign. They serve Cuban-inspired food that is absolutely wonderful. Fritas are Cuban burgers - they have chorizo, beef, black bean for the vegetarians, etc - served on soft rolls with fries on top. I first tried the beef frita and devoured it in a matter of minutes. I've also had their pulled pork sandwich, served with a really sweet slaw on top. The twice-fried plantains are also delicious... I could go on and on. Since that first dinner there, I have been back at least once almost every weekend. The second part of the restaurant's name is from the special drinks they serve, batidos. They're a type of milkshake that is thick and creamy. Once they get their liquor license, you can add a splash of rum, too, if you are so inclined. I tried a few flavors, but then fell in love with the Caramel Rum Cream batido. Oh man... it just might be one of the most delicious drinks I have ever tasted. I drank half of it in the ten minute walk back to my house to take this picture. Look - it comes with a little umbrella! The casual atmosphere is also great - rather than having a bunch of individual tables, there are several long picnic tables and benches. It's fun to be able to chat with new people next to you, or squeeze all your friends into one. I cannot tell you how much I will miss this place, especially since I only discovered it in the last couple months. If you stay in Ann Arbor, it is definitely worth a try. It's over on West Washington, just a block off Main Street. Try the batidos. You will love them. Here is another entry in the series about places I will miss in Ann Arbor! In the photo on top, you can see Red Hawk, the bar with the awesome drink specials. The second photo looks towards campus, and you can see the Natural Science building and Mason Hall. The third photo shows Nickel's Arcade and way down toward the corner is Ashley's. Doesn't it just ooze knowledge? Walking up State Street, you are often surrounded by other students heading to class. It's easy to run into someone you know. It feels both academic and slightly separated from classes, since the street also houses places to grab food, coffee, and cute clothes. I've been a little bummed that in the past year, a CVS and a 7-11 have opened on State Street, so it feels a little more corporate and a little less unique. I have several friends who are thrilled, though, and I do like that milk is cheaper at the CVS than at the other grocery store within walking distance of my house. (This all relates back to a class I just finished up, so I will leave the discussion there.) But especially from the corner of North U and State, you can turn one way to walk towards the Diag, another way to grab some dinner, and a third to just wander through town. I love it. In the first photo, you can see a few stores including the Vault of Midnight. Such a cool name. In the second photo, you can see some of the fancier restaurants, including the Chop House and La Dolce Vita. People were eating at tables outside today! It's always a real sign of spring. Walking around Main Street makes me imagine the life I hope to be leading when I am a real adult (which will be happening much too soon). Hopefully I will be spending time in classy bars drinking fancy drinks, but also I hope to be visiting interesting, beautiful places. During the winter, all the trees on Main Street have little white lights in them and the entire street looks magical. I hope that wherever I end up will have little things like that to make it beautiful. Here is one of Ann Arbor's Fairy Doors! I mentioned them in my last post, too. There are several up and down Main, and they add to the sense of magic that I find in Ann Arbor. With only seven days left in town, I'm going to try to see as much of the city as possible! Feel free to suggest some bucket list items for me! As graduation approaches, I'm experiencing a lot of "lasts" - last shift at work, last day of college classes, last time I'll see some of my friends, etc. 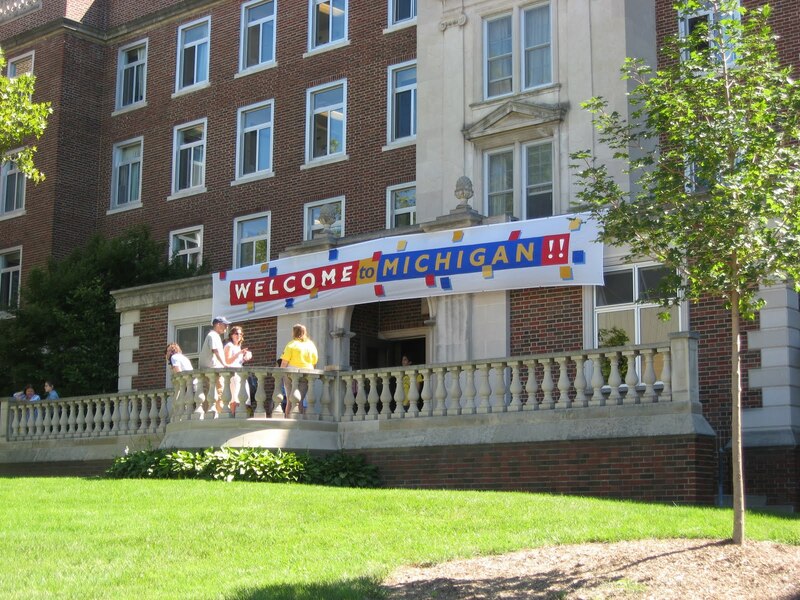 In order to avoid getting caught up in the sadness of leaving a place that I've loved for the past four years, I thought I would share a few "firsts" from my time in Ann Arbor. First dorm on move in day! My first discussion section for Biology and Human Affairs was actually a no-go. Because it occurred before the first lecture, our graduate student didn't show up and we didn't actually have class. It took us fifteen minutes to decide to leave, though, and during that time I had my first interaction with an older classmate. She looked at me and said, "You're a freshman, right?" When I asked how she knew, she responded, "You look nervous." Hopefully the raw fear in my eyes has faded by now. First Trip Off Campus: It was fall break of freshman year and I had decided to venture away from the libraries and coffee shops on State Street to a new place in "real people's" Ann Arbor: Sweetwater's Café off of Main Street. 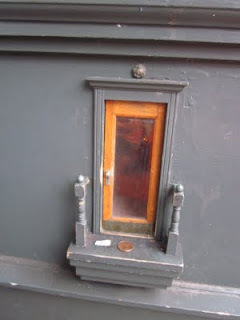 I picked it partially because it had one of Ann Arbor's Fairy Doors. (They're all over - check out that website to see! They are adorable.) However, getting to Sweetwater's took an embarrassing amount of preparation. Not only did I memorize the location and my route so I wouldn't get lost around Main Street, but I memorized the menu so I wouldn't look stupid when I got there. So with my drink of choice picked out in advance, I ventured west of campus to get new fancy coffee, look at a fairy door, and study for midterms. Happily my (small) adventure was a success. I did not get lost, I did not embarrass myself by staring at the menu and holding up the line, and I got a decent amount of work done. I felt so accomplished by the time I walked back to my dorm that I took an alternative route home. Even more happily, my sense of adventure has expanded since October 2007, and I can try new coffee shops and bars without hesitation. I'm even less afraid of getting lost! First Drinks at Bars: When I turned 21, most of my friends were younger than me, but a few older ones took me out to Ashley's on State Street and bought me a couple beers for my birthday. We had a great night and Ashley's remains one of my favorite bars. They have an extensive beer list all compiled in a great descriptive menu. Sadly I don't quite remember what my first drinks were - likely a Strongbow cider and a Delirium Tremens (which one of my friends highly recommended with good reason!). Once I branched out and started trying the college bars on South University, I found myself in a slight dilemma. Loud, wild college bars do have drink menus, but everyone seems to know what they want without looking. I had started hanging out with a guy I was trying to impress, so I didn't want to seem young and silly by studying the drink menus and picking something that was mostly juice. When faced with the bartenders asking me what I wanted, I defaulted to advice from my best friend (who is one month older than me): always order a gin and tonic, because it's classy. Luckily, I also found that gin and tonics are pretty tasty. The guy I was hanging out with seemed sufficiently impressed/not judgmental of my drink selection. Success! Well, at least I considered it a success until another friend laughed and told me that gin and tonics are "an old man drink." By then I had relaxed enough to check out the menus and try new things. I didn't have a repeat of my meticulously planned trip to Sweetwater's, and I discovered a drink I liked even better than gin and tonics, the John Daly (sweet tea vodka and lemonade). corner from the student section. 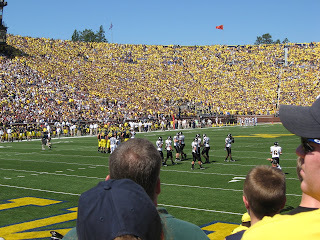 Football Saturdays have remained one of my favorite parts of being at Michigan. The stadium holds more than three times the population of my hometown, the cheers in the student section are a lot of fun, and the games are always exciting. 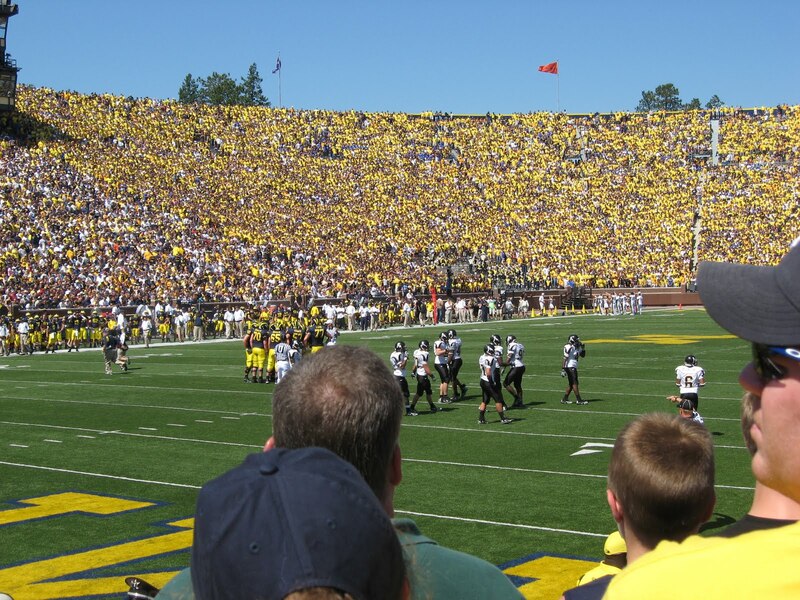 Michigan fans have an incredible amount of spirit, and I have loved being a part of the Saturday tradition. It's fun to walk down the street and know if you yell "GO!" at the top of your lungs, many people will turn to yell "BLUE!" back at you. Instead of dwelling on my lasts, I've enjoyed looking back on some firsts to see how much I've changed in the past four years. I am also already looking forward to new firsts: first real job, first time living in a major city, first day that I can say I'm not a student, and maybe in the future first day as a graduate student. I'll keep updating this so you can hear how they turn out! 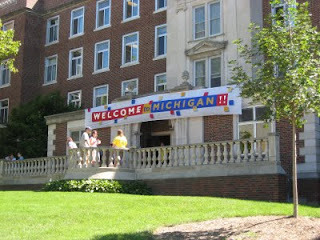 Today's post about the places I will miss in Ann Arbor will be a little bit different than usual. These are places you might be less likely to visit, but they are still worth your time! I have a desk in my bedroom, but I don't use it. This photograph should explain why. To be fair, this is worse than usual. So when I wrote my thesis, I had to relocate to actually get some work done. There was the dining room table, which is painted like the field in the Big House. Also, there was the basement couch, where I wrote my first chapter while watching Criminal Minds. That probably explains why my first draft was, well... not great. But it was a draft! At least I didn't throw in any references to unsubs. It's like you're outside already! Plus the weather is always beautiful! I also wrote a lot in the grad library, where you do not need a key to enter. The reading room is gorgeous and less intimidating than the Law Library. When I go there to work, I tend to spread out on the long tables and take up at least three people's worth of room. These are just a few of the numerous places around campus to study. There are dozens of coffee shops, libraries, cozy spots in the Union... I've enjoyed exploring them in the past four years. Even if you're just looking for somewhere to curl up and read a good book, it's worth making friends with a Classics major or finding your way through the grad! Where are your favorite study spots in Ann Arbor? Sunday April 3 at 7 PM at the Michigan Theater! This post is less about a place I will miss in Ann Arbor and more a significant part of my college career that will be hard to leave behind. 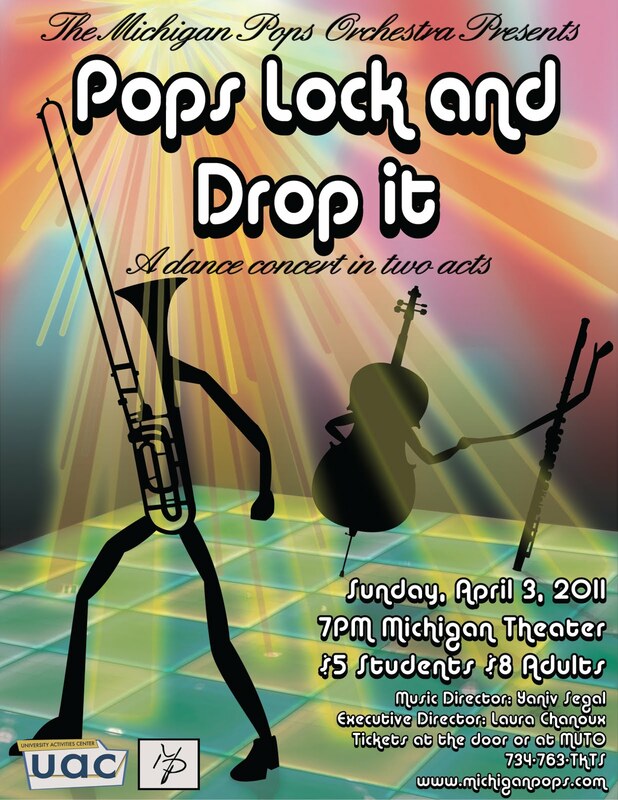 In September 2007, I auditioned and got in to the Michigan Pops Orchestra, the oldest collegiate pops orchestra and the only entirely student-run, student-directed orchestra on campus. It was much more than I expected - in addition to putting on fantastic concerts, complete with light saber battles and funny movies projected behind the stage, Pops also organized social events for its members to get to know each other and develop Pops Love within the group. 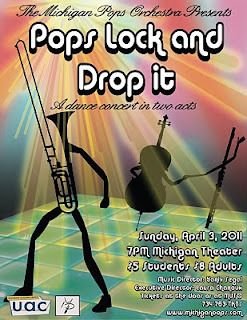 In many ways, Pops became an extra family for me and a group of friends that shaped my four years at U of M.
I've performed in seven Pops concerts: Pops Goes Wild, Victors & Villains, Pops: Forward to the Past, Epic Pops, aPOPScalypse, Pops in Love, Where in the World is Michigan Pops?, and tomorrow will be number eight, Pops Lock and Drop It: A Dance Concert in Two Acts. It's amazing to look back on these past few years and realize how lucky I've been. I've gotten to work with incredible musicians and composers, and I've met some of my best friends through Pops. 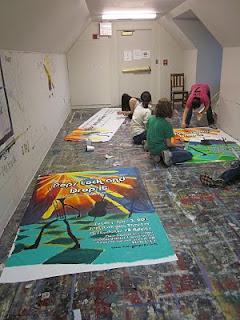 It's weird and a little difficult to think ahead to next November when I'm not painting posters or handbilling on the Diag for the fall concert. As I leave and watch my younger friends get ready for next year, I'm happy to know that more U of M students will have the chance to experience Pops, Pops concerts, and Pops Love. Even if you're not in the orchestra, I think our concerts are so fun that you can feel the spirit of the group and the enthusiasm everyone has for the music we create together. So tomorrow! 7 PM at the Michigan Theater! It's a night full of dance music, from Swan Lake to Michael Jackson, that I hope everyone will love.